My wife is amazing. As her friends will tell you, a life with Cara Lynn Shultz is filled with laughter, creativity, fun, adventure and lots and lots of cat photos. She is a born and bred true New Yorker which these days, is harder and harder to find. When Cara becomes passionate about something, get out of her way because she will commit 1000% to whatever that is including friendships, a love of Cheese and most specifically, writing. Cara is an author and has just released her 3rd book. 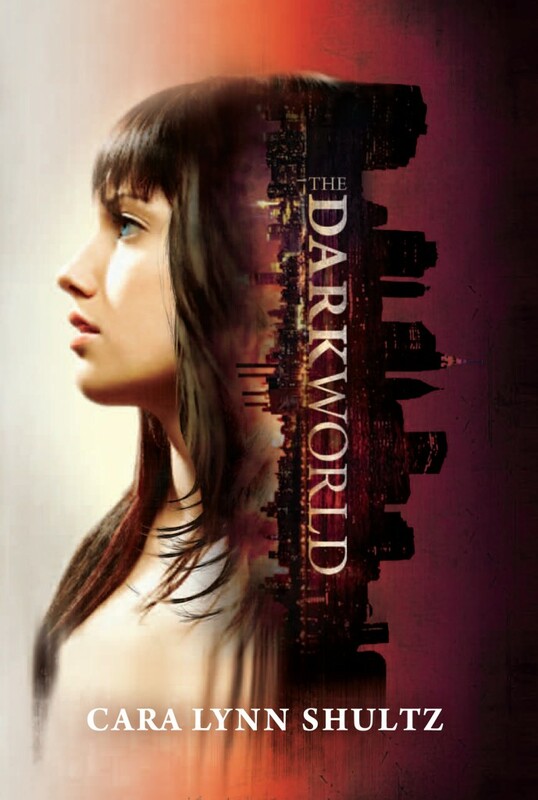 It’s a supernatural teen romance named The Dark World, available via Harlequin Teen. The book tells the story of Paige Kelly, a teenager living in NYC who can see and talk to ghosts. If that’s not already strange enough, she’s also being chased by Demons who live in a world that mirrors ours called “The Dark World.” Turns out the young Ms. Paige is a portal between the two worlds and is now at the center of a war between the powers that be on either side. More is revealed to her by the new boy in school, Logan Bradley who just so happens to turn out to be a demonslayer. Battles, Food and romance ensues. Cara’s writing since her “Spellbound” series has really taken a leap forward. Her ability to develop characters and story arcs is so good that you don’t even think of it in that way until you’re done with the book. The characters are believable, lovable and with very distinct personalities that help to deliver the tale of a world that the opposite of the one we live in. While I loved Paige and Logan and their interactions, it was really the ensemble gathered around them that helps to deliver the nuances of the story. While you may only get a few moments with the erratic goofiness of the demon Ajax, or the cutesiness of a girl stuck of the 50s living in the modern world as hormonal pre-teen ghost like Dottie, it’s these moments that make this a really fun and exciting adventure to be a part of. The visuals that Cara’s words create are so life like and vivid that you not only can see them in your mind but you will be living the story right along side of the characters. Of course it’s not all love, swords and demons, Cara make sure there is always a good moment of clarity colored in by Paige’s snarky and quick witted humor. It’s as much Paige’s coping mechanism as it is her way into, or out of, the hearts of others. As I plowed through the story, I found myself creating moments in my own day where I could get in another chapter or even just a few more pages. I couldn’t keep myself away it. You can bet the moment I can get my hands on the sequel, I’ll be lost in The Dark World just like Logan and Paige. 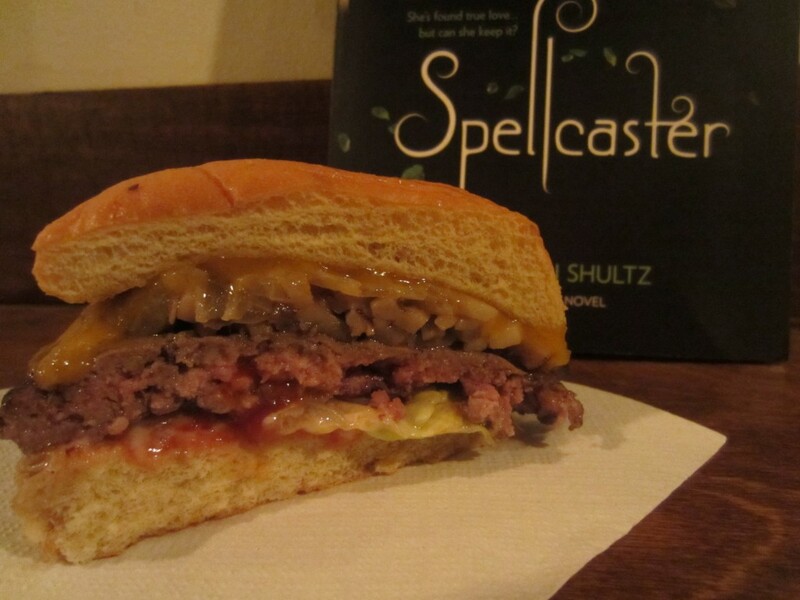 For Cara’s last book, Spellcaster, we created a burger that “paired” with the novel called the “Spellburger.” It was a Burger topped with Sauteed Mushrooms, Sauteed Onions, Lettuce, Cheddar Cheese, Ketchup and Mayo. Seeing as how my audience is fellow Burger and Food fanatics, the only way to share with you my excitement for her new book without going off topic on this blog was to do the same for this book. So with that, I present to you The Dark Work Ajax Burger. 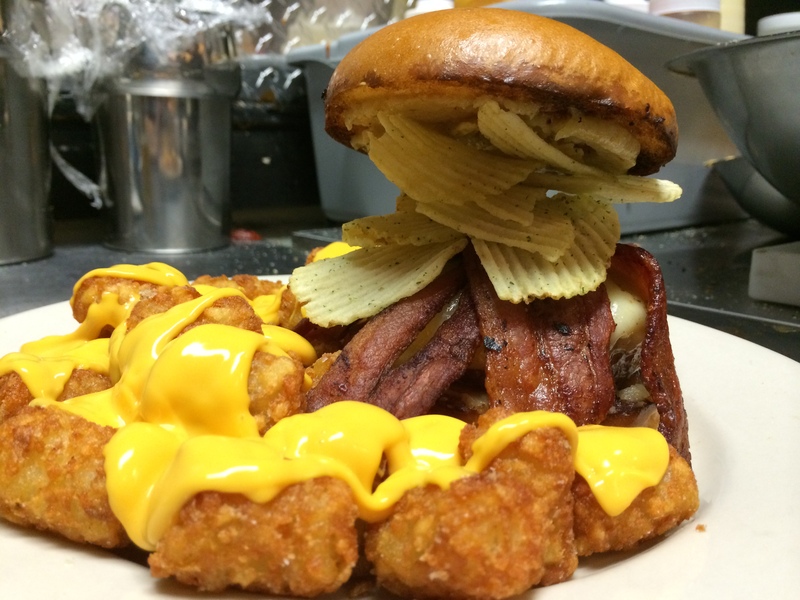 The Dark World Ajax Burger – Burger Maker’s Signature Custom Blend of Chuck and Hangar Fresh Ground Beef, topped with Fried Bacon, a Bacon Onion Jam, White Cheddar and Ruffles Sour Cream and Onion Potato Chips. It’s served on a Buttered and Grilled Brioche Bun and served with a heaping pile of Crispy Tater Tots covered in Cheese Sauce. Here, look at it again. Chef Dennis made it up in our kitchen at Idle Hands and we all got to have a bite. It was amazing and I truly believe that if Ajax were really living amongst us, he would LOVE this burger. Unfortunately I haven’t figured out what’s in Sunwine yet (read the book) so I haven’t been able to pair it yet appropriately. But, if we can talk Cara into having a book release party at Idle Hands Bar, we can talk Dennis into making these and I will find the most appropriate Light World version of a Sunwine. If you buy The Dark World and enjoy it, please go post a review on Goodreads.com. P.S. 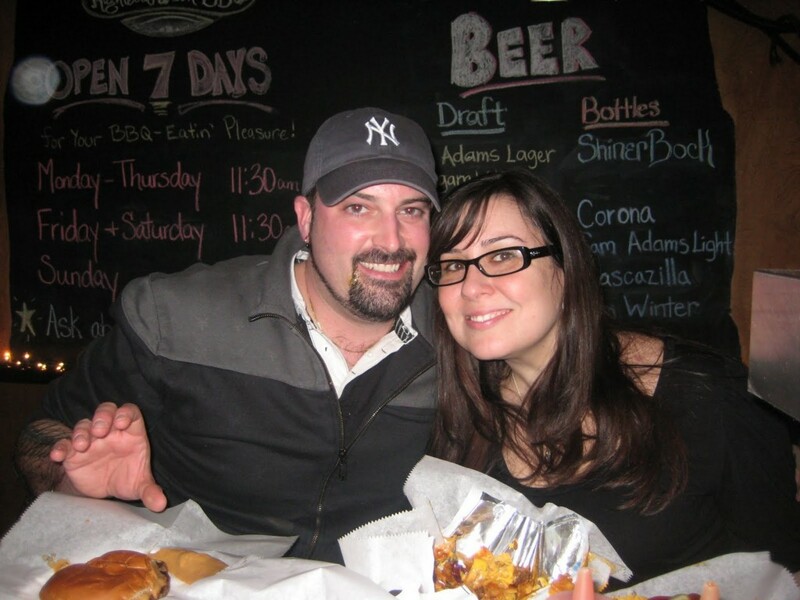 If you’re wondering where Cara likes to get a Burger in NYC, check out Molly’s Shebeen. This entry was posted in Burgers, Gourmet Burgers and tagged ajax, bar, best burger, best burgers in nyc, book pairing, burger blog, burger club, burger conquest, cara lynn shultz, cheese, ciancio, david, french fries, gourmet burger, great burger, hamburger, nyc, restaurant, rev, review, the dark world. Bookmark the permalink.